With free-agency among us, there is a lot of change coming for the New York Giants defense. A look at what going from a 4-3 defense to a 3-4 may require some outside-the-box thinking. With a linebacker core that has been the glaring hole in the Giants defense, new GM Dave Gettleman began to address that quickly by trading for proven veteran Alec Ogletree. But this is not the only change coming for the Giants roster. 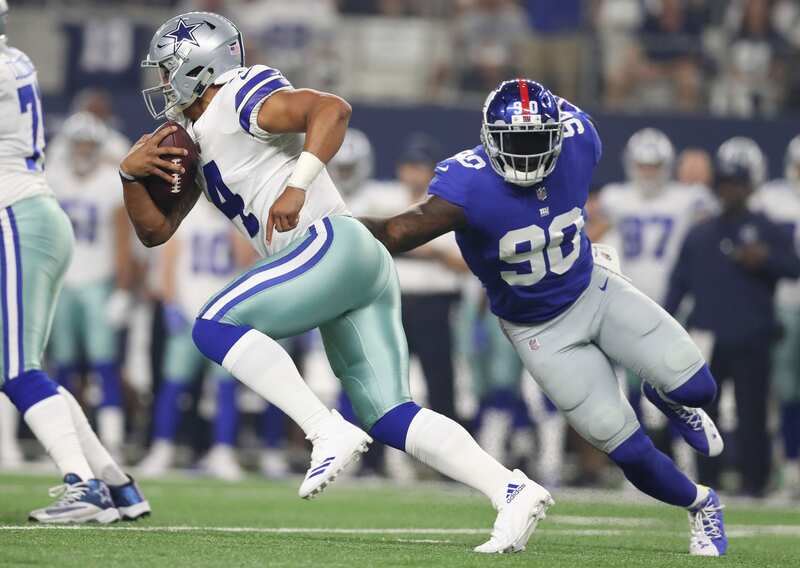 Looking at what might change for the defensive line and linebacker core, I cannot help but think about Jason Pierre-Paul and Olivier Vernon and what their role may become. Both OV and JPP are proven edge rushers and can both play the run as well; both have played with the hand in the dirt and off the line as well. Although their pass-coverage has gone fairly untested, it is possible that they could transition into an edge rusher/ OLB role. This could be the answer for a James Bettcher defense that loves blitzing the quarterback. That change would bring some change to the defensive line as well. Damon (Snacks) Harrison is one of the best run-stoppers in the NFL and Dalvin Tomlinson looks to improve off of an impressive rookie season, ranking as the top rookie interior defender in the league. Adding some depth to the defensive line would be a must. Resigning Jay Bromley, who has been serviceable for the Giants over the past few years, would be a cheaper option to add depth. Bringing in one of the many quality defensive line free agent options is likely as well. The change in scheme may not effect the Giants secondary as much as the rest of the defense. But with Dominic Rodgers-Cromartie’s recent release, Eli Apple’s 2017 tailspin, and Janoris Jenkins coming off ankle surgery, there are more than just a few questions with the secondary. Bringing in more depth is a must to help support Landon Collins and co. in the secondary. Ross Cockrell played well down the stretch of the season and should provide some optimism for this group (three interceptions).